The 7ft sword was taken from the museum on Canna. 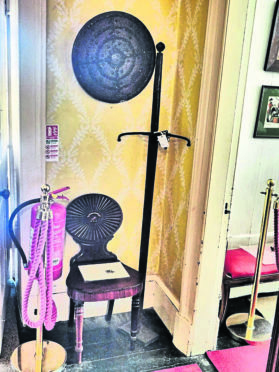 Police are investigating the bizarre theft of a 400-year-old claymore sword from a museum on the tiny island of Canna. An officer from Mallaig was sent to the Hebridean island after staff at Canna House reported the 17th century sword missing. Constable Neil Davies said: “Incidents like this are extremely unusual in the Small Isles and I can assure people we are working to establish what has happened to the sword. “We would like to speak to anybody with information which could help with our inquiries. Canna has been in the care of the National Trust for Scotland since 1981 and the operations manager for the islands, Alan Rankin, said: “We are very concerned that this significant piece from Canna’s collection appears to have been stolen. “It’s been an important part of the house’s rich and unique collection for decades. The sword was removed from Canna House some time between Wednesday, June 6, and Saturday, June 9. The 7ft sword is described as a two handled broadsword with a double edged blade, a wooden grip and a stamped ‘fleur de lys’ – a stylised lily. Anyone with information can contact Police Scotland on 101 or call Crimestoppers on 0800 555 111. Crime is very rare on the island, which has 18 residents, and there is no daily police presence. In 2015 a police officer was sent from the mainland to investigate the theft of confectionery, batteries and hand-knitted hats from the volunteer-run community shop. After the theft, the trust started locking the shop when it was not staffed.